So. We have skulls, we have skeletons, we have a lot of pink flowers, a pinky name, and a scathing theme for the new single - "New Drug Queens". It doesn't get more Velvet Underground than this. 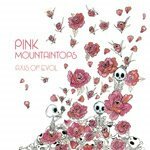 Taken from the Pink Mountaintops new and second LP, "Axis of Evol", here are the new drug queens. They sound a bit electronic, a bit sludgy, a bit rough and very, very dirty. I wonder it they like playing with hedgehogs as well? Oh, god save the queens.